The schedule today includes February trade (likely a wider deficit to $53.4 billion, says Bloomberg) and wholesale inventories, which normally we don’t understand let alone care about but it’s a big deal to the Atlanta Fed in its revision of GDP, a new one later today. We also get the Beige Book and the usual nitpicking over how often this word or that word is used or missing. The next FOMC is coming up on the inside track—May 1. Usually we can dismiss Chinese data as partly fiction, partly wishful thinking, party PR and a dollop of accuracy. If China massages data to suit an agenda, what can we make of today’s information? First, China claims no change in overall growth while everyone agrees the US will have slower growth in 2019 and 2020 than in 2018. 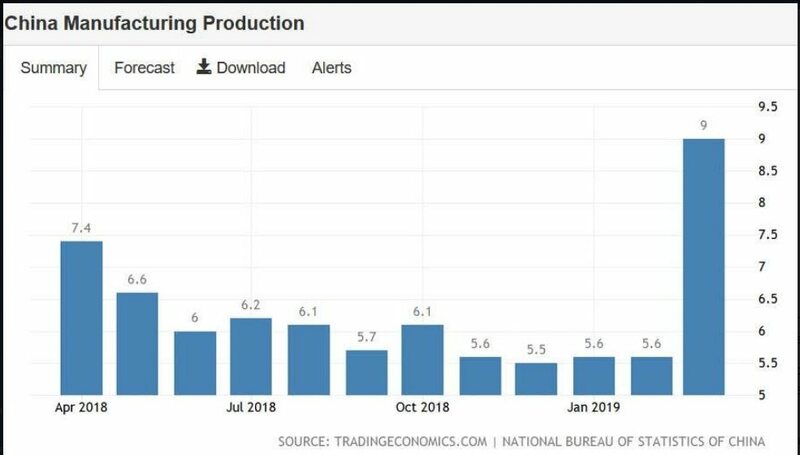 China also claims, improbably, that manufacturing jumped 9% while the US is getting a measly 1%. The numbers might be fake but the idea is not—China can increase manufacturing far more than the US simply because it’s still a developing sector. Off on the side is the scary thought that if the US succeeds in keeping copyrighted high tech stuff out of China, they don’t really need to counterfeit it—they are getting the capability of inventing it themselves. It may be state-sponsored instead of unwashed guys in a garage, but so what. In other words, the message in the latest Chinese data may be “We do not need you, Mr. Trump.” China has already overcome what damage the tariffs inflicted. China can always bounce back. China can thumb its nose at Trump but is too polite to put it that way. China gets a watchdog capability, too? Watch out, US. Want to ban Huawei? Hmm, what might China ban? Boeing, maybe. Not to overstate things, but China appears to have the upper hand at the moment. If Trump is desperate for a deal with China, the pundits may end up being right that the actual deal itself is irrelevant—Trump just wants the bragging rights to his base. By the time the base figures out they got no benefits from the trade deal, they will have re-elected him. Sort of like the tax cuts. Besides, Trump gets to move on to Japan and Europe on trade, plus there is Natfa 2.0 cooking on the back burners. Plenty of rant-and-rave press spotlight fuel here. One last worry: Trump is being abnormally quiet. The Mueller report, full of multi-colored redactions, goes to Congress tomorrow. Trump went from a stance of saying the report exonerates him and let everyone have it to a new stance of “keep it out of the public eye and investigate the investigators.” Logic is not Trump’s strong suit. Nor that of his base. To distract attention, what new outrage is he going to invent? If it’s not the Fed, not trade, and not closing the border, what can it be? Now is a good time to stay out of the FX market. The holiday is beginning and holidays always bring low participation and the risk of choppiness. We are going back under a blanket with a few good books. We got all the way to page 50 in Niall Ferguson’s The Square and the Tower before his arrogance pricked our pique. We will finish a far more likable writer, Annie Duke—Thinking in Bets (highly recommended).